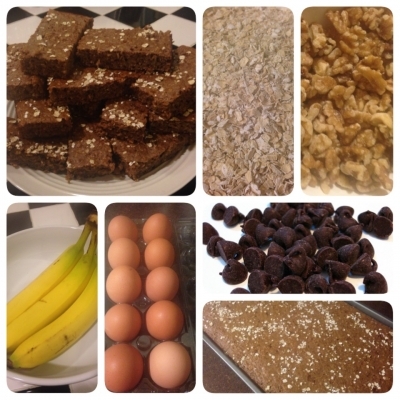 Delicious breakfast bars with a little protein kick. Perfect with your morning coffee! *Preheat oven to 350 degree Fahrenheit. *Whisk together protein powder, flour, oats (set aside one tbsp for topping), baking powder, baking soda, cinnamon, and nutmeg in large bowl. *In another large bowl mash bananas. Add applesauce and yogurt and blend on medium speed until almost smooth. *In a food processor, crush the walnuts. Some small pieces are fine. *Add eggs and walnuts to the banana mixture and blend for 20 seconds more. *Pour batter into a 10" x 15" jelly roll pan. Spread to edges if necessary. Sprinkle remaining oats and brown sugar on top evenly. *Bake 15 minutes or until toothpick comes out of center clean. *Allow to cool on cooling rack before slicing.